When we were kids, my friend Catherine and I both spent a lot of time in doctor’s waiting rooms. This weekend on our retreat we were reminiscing about a book of stories we would read while waiting. The stories were always parables about good character, with a Christian flavor. There was a story about some kids who started a club that left surprise packages for neighbors and shut-ins, and one about a selfish boy who always grabbed the biggest piece of pie or cake for himself. His mother set up a family feast in which the biggest and tastiest-looking items were the nastiest: chocolate candy filled with something bitter, a hollow pie. The boy learned his lesson that day and always waited for the others to choose first. We remembered the stories vividly, but couldn’t remember the name of the book. Well, today Catherine tracked it down: Uncle Arthur’s Bedtime Stories. Anybody else remember them? I was actually searching the web for copies of Uncle Arthur’s stories, and ran across your site. My Mom used to read them to us. I have a personal favorite…the one about the toothpaste …how hateful words coming out of your mouth are like squeezing the toothpaste out of the tube…once they are out, you can never put them back. I’m almost 50 now and have never forgotten that story… I’d love to find a copy of the books to share with my kids. That’s the amazing thing — how vivid those stories were! I’ll never forget the one about the greedy boy and the hollow pie. You can get the books through Amazon but they are very expensive. And for me, The Surprise Package Company was most memorable. I looked all around the web and there are so many volumes and editions that I’d have a hard time figuring out which one it was I read. The UN has *not* denied the Holocaust. A friend sent me an email and it was about ‘I can sleep when the wind blows’ and its beautiful and at the end it mentions Uncle Arthur’s stories. It immediately took me right back to my childhood in New Zealand. I have four brothers and when we were young my parents would read to us from Uncle Arthur’s Bedtime stories. They had a big impact. My Mum passed away a bit over two years ago and I would just love to be able to say to her, Hey Mum, guess what I have found. I came from a broken family and rather lacked parental guidance most of my life. One day, our school librarian gave me a copy of one of Uncle Arthur’s books and I will forever be grateful. Uncle Arthur’s books gave me some solace and a push in the right direction. My favorite story is about a boy and his “friend from the bus” and of how a simple act of courtesy and friendliness can bring such great rewards. when i was growing up deep in an African village in the early 70’s, we were poor and my parents couldnt afford to buy books. then a miracle happened. i visited a family in the city who happened to have a bedtime story book by Uncle Arthur. i never forgot the stories and i promised myself that when i grew up i would buy the set and keep it for my chldren. i bought the books when i got married and enjoyed reading them so much. the kids then came and i enjoyed reading to them as much. My favourite story was the kid and the hollow pie. The books helped shape the way my kids grew up. Thank you so so much. i will soon be a grandma and the books are still around . cant wait to read to my grandchild. I’m still trying to find the volume I want at a reasonable price. I grew up listening to these stories a lot. In fact, my grandpa used to sell these books, so my family ended up with a few old display copies that were for doctor’s offices and stuff. We also had a whole set of Uncle Arthur’s Bedtime Stories. You can get some at http://www.uncle-arthurs.com/ua/browse_books.php. Not all the books it lists are currently available, but some are. If you don’t want to pay as much, you can get a new set of some of Uncle Arthur’s stories (a more recent compilation) at this website: http://www.adventistbookcenter.com/Detail.tpl?sku=0904748995. http://www.adventistbookcenter.com/browse.tpl. You can also get a CD of Uncle Arthur telling some of his stories (we had a tape of that when I was a kid, and it was really fun to listen to). I hope you guys can find what you’re looking for! My grandmother bought a set of Bed Time stories at campmeeting during the 70’s. I remember reading them every Sabbath afternoon at her house. I read every single volume time and time again. I read them to my children when they were young and even now as teenagers they still sometimes want to hear them. I often use the stories when I tell children’s story as church. People tell me what a great story teller I am but really I owe it all to Uncle Arthur! “Wilfred’s Secret” is the name of the story about the Surprise Package Company. It is the second story in the first volume of the 1964 edition. “The Hollow Pie” is also in the first volume. “The Two Carolines” is in volume two. We have the 20 volume set. My mother used to read them to us as children and now I read them to my children. They love them and I love reading to them. The other day my four year old mentioned the moral of one of the stories that I had read months ago. He had to remind me which story it was from and then I remembered and he had the moral of the story correct and recalled it at an appropriate time. I go through about one volume a month. They would have me read even more but I try to make them last so I supplement these stories with The Bible Stories ten volume set by Uncle Arthur. They like these as well. haven’t I think I can get you one. bedtime stories. God Bless You !!! I’m looking for Volume 1 (the same one Catherine was) – so according to Adam I want Volume 1 of the 1964 edition. Anyone know where to buy a copy? Thank you Adam, I did not realize I should have been searching for Wilfred’s Secret rather than the Surprise Package Company. That story was my daughter’s favorite and now that she is a mother herself I would love to give her a copy for Christmas. So I am also looking for Volume 1 of the 1964 edition. Anyone know where there is still a copy? You should try Abe Books (online). They list several different volumes and sets. I have a copy of Volume 1 and I think it is the 1964 edition. I’ve been reading it to my 5 yo niece and 8 yo nephew a lot over the last few months. They really enjoy it. I found this blog because I am trying to find a listing of the Tables of Contents of the different volumes. Anyone have any ideas about that? Thanks Gwendolyn, I will give Abe Books a try. No idea about Tables of Contents, sorry. Good question though, good luck with that. Am I the only one who got nightmares from these books? I’m 55 and read them when I was very young; the ones I remember are the terrifying ones like the girl who got malaria and lied about taking her quinine medicine and almost died! Cats and babies dying in house fires! People being buried alive under rocks! When it came to learning morals and behavioral lessons “Mrs. Piggle Wiggle” actually taught me more, I think. Aaargh! I just remembered the one about the little boy who died with his hand propped up so Jesus would take him! These horrified me! slant on it. ie. at least he knew he wanted to go to be with Jesus and his friend helped him to do that by propping his arm up for him. Helping him to find Christ in a way. Still makes me cry though! I was looking for the 1940’s edition with the plain red cloth cover when I came across all these comments! The story I was thinking of was about a little girl who was very curious and was always disassembling things-in my minds eye I swear I see a picture of her with a screwdriver and an alarm clock. ( Sometimes I wonder if this is the start of losing short term memory and having long term become even more vivid.) I also remember a very scary(to me) full page picture of Jesus on the right side of the book-not the one on the cross but one of Him knocking at your door?? I am also looking for another book of that era and this is all I remember—-it had a navy blue cloth cover and I think the title had something to do with angels or guardian angel. Anybody else remember it? Dr. Bauer’s Optometry office in Loogootee has a copy and it is the one with the story about the surprise packages for the neighbors and shut-ins! I’m 56 years old and remember these when I was a child. I used to read them in Dr. Sorrells’ office in Bedford. I probably saw them at Dr. Bauer’s at some point, too. For anyone looking at this site you can find Uncle arthurs Bedtime Stories on several sites and can find really good deals. You just have to take the time to look. I found my at a yard sale. I also found more to complete my set on ebay. I am sure alot of bookstores have these books also. Please don’t quit looking…. I grew up in Kenya in the seventies, a Hindu child in a joint family with thirteen cousins and siblings. Amidst the chaos of life in a joint family, I discovered Uncle Arthur’s Bedtime Stories in a Christian reading room. His stories brought calm and solace, and a firm set of moral values that otherwise would have been passed on patchily or not at all in the bustle of a joint family. i remember fuzzily the story about the boy that heaped “hot coals” (?). Although I am still a HIndu (although not a practising one), I cherish the guiding force that Uncle Arthur’s stories provided in my childhood. That’s the one! I just bought 5 volumes of Uncle Arthur at a rummage sale, looking specifically for that story. Couldn’t find it, so I turned to Google and found this page. The storyline: Little Billy was in a terrible accident and lay in hospital in awful pain. Little Timmy visits and helps to prop his arm up on pillows, saying that’s how Jesus will know to come take him to Heaven. By morning … Little Billy is dead! I read that one as a young kid (waiting for the dentist to come take me to the chair). Quite an impression; that night and on successive nights, I experimented with propping up my arm a bit more … a bit more. Don’t recall how many times, but I well remember the morning I woke with my arm still fully propped up … kind of amazing in itself, and I got “pins and needles” like my hand was on fire, but mostly I was thrilled to prove the author of the book was a big liar! I have managed to assemble the entire 20-volume set from the 1964-1967 printing, but it cost me several hundred dollars, between eBay and Amazon. My advice to anyone looking for these volumes is: You will find the first few volumes much quicker than the later ones. The higher the volume, the rarer it is. I got a matching set of the first 10 volumes, it’s a plain dark brown cover with no pictures like the ones I remember. Volumes 11-20 have the pictures, and I had to buy those piecemeal. It took me almost 2 years to find them all. I have a set of Uncle Arthur’s Bedtime Stories that belonged to my Mother and her sisters (my mom is 92 years old). I can’t find a date in any of the books, but then again, there are only a couple that still have a cover on them. I treasure these books very much. The books are numbered (series 1) thru (series 16). we still have a copy at home…and as i was reading the other posts my mom reminded me of swami and the crocodiles. a bit gruesome, but if this story is true (i dont know of any claim of its being true/false), it’s worth telling. I have been looking for a book we had when I was a child, that may well have been one of the Uncle Arthur’s books. Does anyone who has this series recognize a story about doughnut holes, and a story about a girl who stole some custard that turned out to be mustard. Both of these were in the book we had, and I would like to find a copy of this book, if I knew which it was. I’m trying to find out which Uncle Arthur’s book & volume this image is in: http://www.zazzle.com/jesus_magnet-147870888491615407 Someone has put this on a magnet (at Zazzle), and it is a copyright violation because I know this person did not create that painting, and very likely does not have a license to use it on commercial products. (in order to keep Zazzle fair and safe to all uses, copyright violations are taken very seriously, and once proven, the products are removed.) This image of Christ (over the world, with His hands outstretched) is one of my favorite images that I first saw many years ago as a kid in a dentist’s office. The image was in one of the Uncle Arthur’s Bible Story books–it was either volume “Book #10 Onward to Glory”, or one of the “Uncle Arthur’s® BEDTIME STORIES” –the one where the cover depicts the mother sitting on a yellow couch reading to her 2 kids (https://cvillewords.files.wordpress.com/2007/04/unclearthur.jpg), as that’s the only “Bed time stories” book from the set the office had. I remember seeing this picture filling the page (the story was about the end times), and I was mesmerized (and sort of scared) by it. I looked at this picture (and the book) everytime we went to the dentist, and ingrained it into my mind. I have never forgotten it. The shopkeeper who has created this magnet is in copyright violation and in order for Zazzle to remove it, I must have either the book volume the image is in & a photo of it, or provide a link that clearly shows this. I cannot find the artist’s name who painted this for the Uncle Arthur series, but I remember this image all too well. Arthur Bedtime books you can find on ebay. At more reasonable prices. Different volumes often will have totally diffrent stories. The ones writen in the 1960’s I believe are one of the best , they have a red cover. Not the real little ones but full sized books. These stories make good children stories for church even in today’s world. One can easily update a story to make it more revelant today. For example, in Arthur’s books a child would be very happy getting a quarter. Today, not a chance, so up the amount to $5.00 or the like. the image you are talking about with Jesus hands outstreatched is in volume 1 copy write date 1976 pg 187. But I belive this photo is in many of the books, not just this particular Uncle ARthur book. I remember these and loved the boy and the hollow pie story too! I used these to teach young children life lessons and how to act to show the character of Jesus to others. I had ONE of Uncle Arthur’s Bedtime Stories book when growing up. It had a dark brown cover….loaned it to a granddaughter who lost it. One story I remember has the same title as Judy Blume “Are you there, God, it’s me Margaret”…about a little girl who talked to God on the phone. Another story about someone falling in a pond….etc. I SO wish I could find this book again. Sorry – I don’t know any other name for it….it was a hard cover one. Can anyone find it for me? Thanks so much! (I read it to my 5 children – now have 18 grandchildren – but can’t find the book any more!!! In 1947, I was in the second grade in south Mississippi and got real sick. 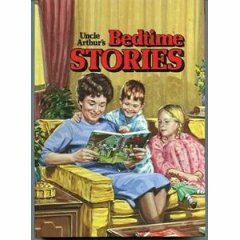 My teacher, a Godly lady, and my class gave me a copy of Uncle Auther’s Bedtime Stories, first series. I still have it. Today, I am 71 years old and my two youngest grandchildren are coming to stay a few days with us. They will get some of the stories read to them. The book made a deep and postive impression on me. Thank you Lord for Godly teachers. I’m so glad you saved your copy, Jim! What a treasure! Recently a son & granddaughter who do not get to come too often visited. She found my shoe box of Uncle Authur’s Bed Time Stories. I have the 1st thru 16th series. My great grandmother gave them to me usually for a birthday. They date from 1927 (prior to my birth 1930) thru the 30’s to 1940. They are somewhat worn due to a lot of use. It brought a smile when she picked my favorite to read-the 1928 4th series with the angel guarding the two children at the edge of the cliff. found with the stotries we all ove so much. Copy the link below and paste it in your web address section…it should open the whole story about the hollow pie and others. Have fun!! Small world indeed! Thanks for posting, Chris. You can find the story at Google books — and lots more too. Hi, am not a good writer, but I’d like to coment too. When I was about 11 (195…), I don’t know who gave me a bedtime story book in wich I read Peter and the pumpkin seed, Why Victor slept so well and one about a little girl hwo made a mess cutting paper, and had to pick up every piece(pedazo) by hand. I was so happy brousing internet and found not only the book but the autor, I am planing to purchase ir soon. Are the stories Mrs Muckleroy’s Mop,Mrs Plinkett Plunkett;s Funny Bone and the story about a little boy who could only say no from Uncle Arthur;s Bedtime stories. I had a small green cloth book in the early 60’s my grandmother gave me but I cannot remember the title or author,would love to read again. I am helping a friend go through her things as she prepares to move to a smaller place. She has a copy of Volume 1, which contains Wilfred’s Secret, The Hollow Pie and many other stories. She was going to sell it at her garage sale, but I am trying to get a fair price for her. I found a price of about $12.99 for another single volume on eBay and a price of $24.99 on another site, so was thinking that about $18.00 would be a fair price to ask. Anyone still looking for this volume? …oh I almost forgot that terrible story about the dirt poor farmer who sacrificed everything to send his son to college…his son matured into a smooth city boy and when dear old Dad came to visit him (driving the family wagon pulled by horses no less) at college the son pretended not to recognize him…dad went home and died of a broken heart….and the son had to hear the sad tale from his heartbroken mom….ouch…that story has stuck with me for over 50 years ! So when my dad came to visit me I would always embrace him publicly in front of all my friends…but I did make him park the horse out of sight….on the other hand I embarrass the heck out of my kids at school all the time….driving up in a dirty old Jeep Wrangler, with tattered jeans and ragged sweat shirt…..they tell their friends they are orphans…thanks a bunch Uncle Arthur ! Angela from Vancouver BC, Canada here….I just bribed my 7 yr old to clean up the toys that the other 4 kids messed up and told her I have a very special book for her to read. It was Grandma’s when she was little! There is no cover but I could see a tiny bit of lettering on the binding that said Unc and Arth and Bedtime. I looked on the net for Uncle Arthur’s Bedtime Stories and here I am and I cannot believe there are so many of YOU out there that enjoyed ‘my’ book from when I was a kid that my mom passed on to me! The one I have has a picture of the Canada/US archway close to my house (pg 333 Frontiers of Peace) I warned my 7 yr old that some of the stories will seem out dated (spankings) but I am super excited to share this with her! I just wish I knew what yr this book is from. The first story seems to be The house that glowed. I have been using these in my Sunday school class for many, many years. I’ve been teaching for 33 years and these books are SO valuable as they teach children God’s commands and life lessons on the children’s level. I love telling these stories over and over, always a new lesson to learn! These stories are applicable in real life. My husband and I actually purchased these books from a door-to-door salesman back in 1978. They are a blessing to have and to learn from no matter what your age! My favorite was Little Miss Grumblestone 🙂 am tryin to find online to read. Volume 1 is the most commonly available one, so it’s not going to be worth all that much. Volume 1 was commonly provided to pediatricians for their waiting rooms. The higher the volume, the rarer and more valuable it will be. I was able to collect all 20 of the 1964 edition that I remember from childhood, but it took a couple of years and about a thousand dollars to do. Check on Amazon and you will see that most sellers who have an Uncle Arthur book have Volume 1. My dad sold these books when he was in college in the 50s. We had the full set of 20 plus about 3 of the first volume since that was the one that was most often left in doctor’s offices. The stories were read to my brother, myself, the 40 plus foster children that came through our home, my children and my sister’s children. I need to check with my mom to see if she still has them or if she gave them to my sister. I loved the pictures in them and remember some of the stories vividly. Some have been mentioned here already, the greedy boy who always took the biggest of everything and, my favorite, the girl who was so sweet to strangers and so nasty to her mother. I also remember one about a fire, I don’t remember the details of the story but the picture of the dad in the hospital bed with skin grafts has really stuck with me! Wendy, North Vancouver, B.C., Canada. Ah, Uncle Arthur. If he only knew how well loved his books would still be all the years after we all grew up having them read to us, reading them by ourselves when we learned to read and then maybe reading them to children too. There is so much now on the Google searches about the books. I just found a website where if you Google a story or a plot, it will give you a site where all the stories are listed according to the character trait it is trying to teach. My 2 books travelled with me as a 6 year old when I came to Canada with my parents. My favourite story was ‘Grumpy’s Gold Watch’ which was in Vol. 8 on page 25! The Adventist Church in the UK still publish a series of 5 smaller books which they will mail internationally. Although they are a newer publication of books, the stories are from the original volumes. Some have been rewritten a little bit but still teach the same wonderful lessons. I honestly feel that part of who I am is because of the lessons I learned from these stories that my dad (now in Heaven) read to me at bedtime when I was just 2 and 3. By the time I was 4, I could read them myself but he and I shared that time together. Blessings to you all who have enjoyed these books as I have over so many years. Even now, I sometimes take them out and read them. PS If you didn’t know, the stories were ones that he received in the mail each year from everyone around the world who knew to write to him. I am looking for an Uncle Arthur story about a little boy getting stung by a bee 2 or 3 times because of his disobedience… I need help locating this volume and story title asap please. Help–I need to find the story “Is That You God?”. I need it for a lesson I am giving and I remember this from when I was a little girl.